This funny bunny is looking for some love! Give her some cute Easter colors to make her as festive as can be. Make your bunny come to life as quick as you can, with this fun race-to-color. 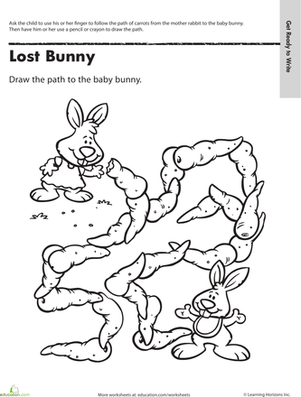 Preschoolers develop their fine motor skills as they help Mama Bunny get back to Baby Bunny in this printable maze. A counting worksheet for preschoolers featuring a toy bunny rabbit. Help your little one get ready for the arrival of the Easter Bunny with this egg-cellent Easter basket coloring page. Help the Easter Bunny collect all of his eggs as he makes his way through the maze. A majestic lioness stalks closer to the edge of page in this coloring page. 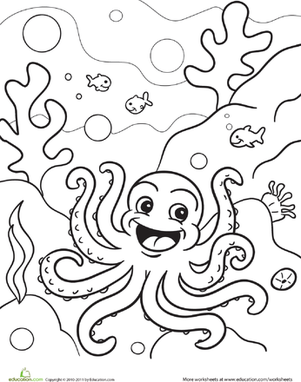 Coloring this adorable octopus coloring page is sure to brighten your preschooler's day. Help this cute bunny find his way home by hopping along the triangles in this fun shapes maze. Here's a parrot coloring page. There's a pretty bird! 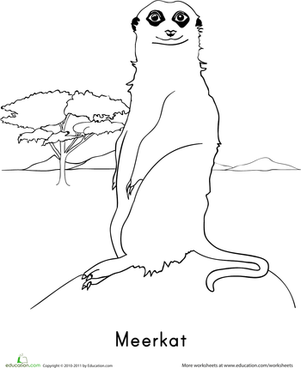 This coloring page features a cute meerkat standing at attention! Introduce your child to the alphabet with this ABC coloring page! Have fun coloring in this horned owl coloring page!